As I mentioned in my last Closet Essentials post, I tend to wear mostly flats or low heeled boots on a daily basis and a reader asked if I could feature some cute (age appropriate) low boots. Some of you have asked why I don't wear heels often, and I've mentioned before that there are several reasons. Number one, they just aren't practical for my everyday life. Number two, I'm pretty tall (around 5' 9 1/2") without shoes, so adding 3-4 inches of height is fine for a special occasion but I tend to feel a bit conspicuous running around in huge heels for a trip to the grocery store. As I'm sure you've noticed in some Style Me Saturday posts, I'm obsessed with these Steve Madden Intyce low wedge boots. I have a similar pair that I bought a couple of years ago from Bakers and I love them. You can also get a less expensive (faux suede) option at Payless for $39.99 if the Steve Madden version is a bit out of your budget. Another pair of boots I have in my closet are some black riding boots that I bought from DSW last fall. Here is a similar pair for $138. 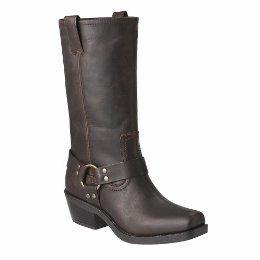 The most recent addition to my closet was this pair of Katherine Engineer boots from Target (click HERE to purchase). A dead ringer for the Frye Harness boots, these are real leather for $49.99 and I absolutely adore them so far. I did some searching and although I'm not currently in the market for any new boots, here are some low heeled versions that caught my eye for under $150. I got the intyce last week too. returned them though. I don't think my legs are wide enough for them. lots of ankle sag-or is that OK?? And they really didn't seem that durable. I LOVE the look of them though. Still trying to find something similar to replace them with.